Yesterday was one of those days at the sanctuary where we had so many people helping (about a dozen girl scouts, in addition to the normal crew) that we got done super fast. I felt like I hardly did anything at all! I did spend some time inside the pig barn, where Harley was in his pen. The new pigs always spend time there at first – they can interact with the other pigs, without being right in the middle of everything. And Harley is just too little to be with the big pigs quite yet. He has his water, which is now a bowl nested inside a tire, since he’d apparently been a rambunctious boy. 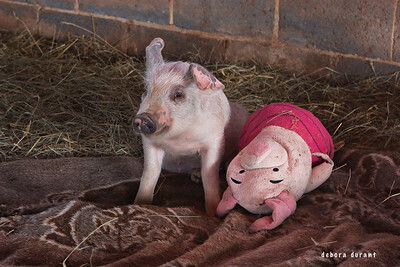 He has lots of fresh hay, a blanket to snuggle on, a heating lamp to make him warm, and … piglet. Piglet is something of a legend by now, his restuffed and restitched body having been a companion to many of the baby pigs who have arrived at the sanctuary. I’m not sure, but I think that someone brought Piglet when Peapod first arrived at the sanctuary, about two years ago. I should ask, to jog my memory. When I made a quick post about Harley last weekend, one of the people who facilitated his rescue ended up finding my post and commenting. I thought that was pretty cool. I told Terry and Dave about it yesterday morning, and we talked more about that part of the rescue. Shana commented again on the Harley post, with a link to the story that she wrote about the rescue. And it really amazes me. Harley is triply lucky, really. He fell off a transport truck, and lived. He was rescued by people who were kind, though his role with them seemed to be something between a pet and a money maker. Shana described their business as an education center, and she doesn’t go into detail about what Harley’s fate was going to be once he got too big for his first rescuers to handle. But from what Terry and Dave told me, the original plan had been for him to be sent to slaughter when he was too big for the first rescuers to have at their education center. So the third piece of Harley’s luck was in having Shana visit the education center. She asked questions, and learned the truth. Shana had lived in the DC area, and already knew about Poplar Spring, so she was able to save Harley, and help him come to Poplar Spring. The details make it clear how precarious his situation was, and how amazing it is that he is safe, now. It is also a really wonderful reminder that each of us can make that kind of difference – life or death – to others. We never know when we’ll be in a situation where asking the right questions and noticing the right details can save someone’s life. We should know that it is always a possibility. Thanks to Shana and her husband for helping to rescue precious Harley, thanks to Shana’s friend Deena for lending them the Jeep so they could get Harley to the place they were to meet Dave, and thanks to Terry and Dave of Poplar Spring Animal Sanctuary and to every other animal sanctuary out there for making sure that there are safe places. … and he eats cow poop! He is, of course, adorable while doing it. I’d managed to completely forget that until you mentioned it! lol. Don’t forget my friend Deanna! She was kind enough to offer her Jeep and to drive all the way to Richmond with Harley and me. I couldn’t have done it without her help! It is just incredible how it all fell into place though. I’m so happy it turned out well. I think the Piglet doll has been around even longer — I remember it being there when I first visited, back with Aubrey was Harley’s size, which was November 2003. And I agree – it really did all work out so well. And hopefully you will get to visit Harley soon! They grow up so fast. Ryan, wow, Piglet has a longer history than I’d realized! I know Terry has to stitch him back up every time he helps out with the babies. I wonder if it was Steve who brought Piglet originally, and in one of the weird tricks my mind does, I associated him with peapod, since I first met steve when peapod was itty bitty. I’ll definitely have to ask about Piglet’s history now, and get it straight!